Our team has recently visited NUBF conference and spoke to many representatives of Norwegian business partnering with Ukraine. Having learned a lot, we would like to answer one of the most frequent questions: how to find a reliable tech partner in Ukraine making no mistakes. Ukraine has become an attractive destination in Europe to outsource software development. This is mostly due to the following factors: a big number of software engineers, their tech skills, and competitive prices. Though many decision-makers are still afraid of working with outsourced tech partners. So we decided to write a short guide on how to secure yourself when outsourcing software development to Ukraine or pretty much any other country. It’s recommended to contact a legal counselor who’s aware of all the peculiarities of legal system in Ukraine before you make a contract with a company. 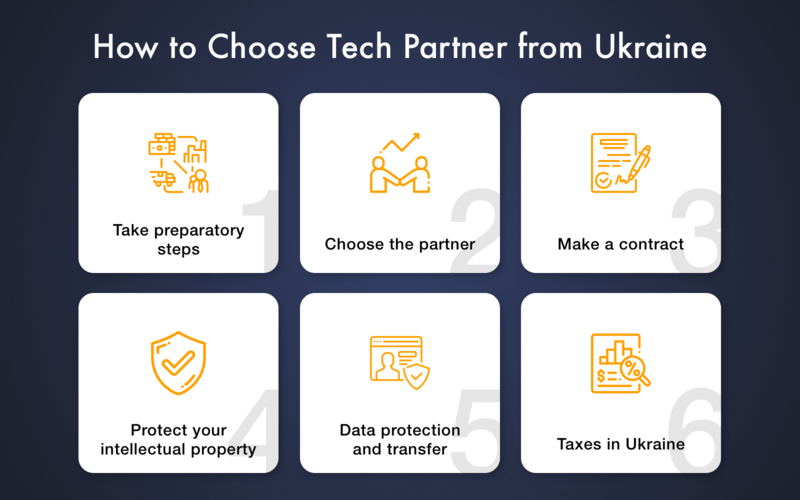 An experienced specialist will ensure the contract’s compliance with Ukrainian law as well as help you evaluate a potential tech partner and choose the right business model to follow. Check references to your potential tech partners as well as their reputation. Most Ukrainian companies are familiar with business cultures of different countries so you’re not likely to face some problems with that. Review your potential partner’s background by checking if any international sanctions have been applied to beneficial owners. Confirm authorities of contractor’s representatives. This can be done by conducting a check of the power of attorney, written authorization or the company’s Charter. Think about launching a pilot project to check the actual facility of the provider to deliver a product. 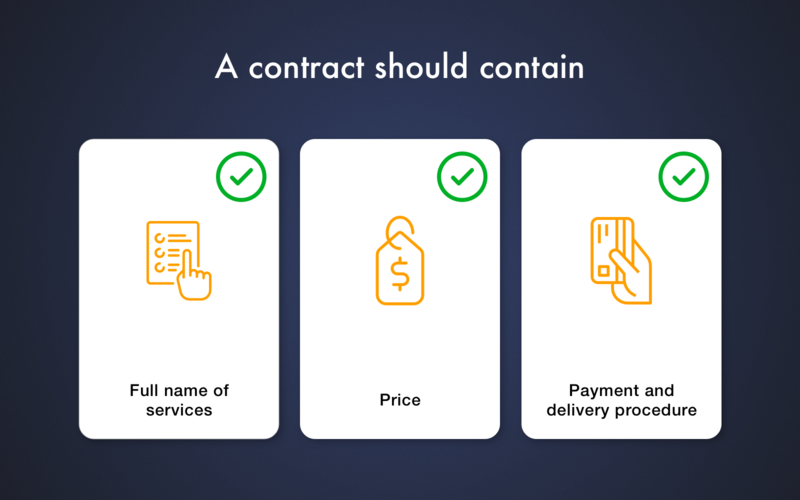 A valid contract should consist of the following substantial terms: full name of services, price, payment and delivery procedure. This topic was given a lot of attention at the conference. Arbitration is recommended as a method of dispute resolution. It’s implemented in the form of an arbitration clause or arbitration agreement and contains all the relevant provisions. Add the anti-corruption clause in the contract. Sign a non-disclosure agreement (NDA) with the partner in case your idea isn’t yet transformed into a product or at least prototype. Cleveroad has been providing an opportunity to sign the NDA agreement for years now and we believe this is a key to mutual trust between a client and tech partner. Transfer of the intellectual property rights should be settled in the contract and cover the volume of property rights transferred to a client. For example, the right to change, sell or transfer the source code of the software should be specified. Make sure the contract between the company and employees are clear and properly cover the transfer of IP-rights between them. Also, check if the company’s IP object has been registered in state registers in accordance with Ukrainian law. The contract should contain a clause with a detailed description of the procedure of data collection, transfer, access, and storage. Make sure the company is aware of EU General Data Protection Regulation (GDPR) requirements. Cleveroad has already developed a system for GDPR compliance. Export of services from Ukraine isn't subjected to regulation from the customs. Usually, it's also not a subject to currency control regulations. Any questions left? Contact our managers to clear them up and get professional consultation regarding outsourcing IT services to Ukraine.